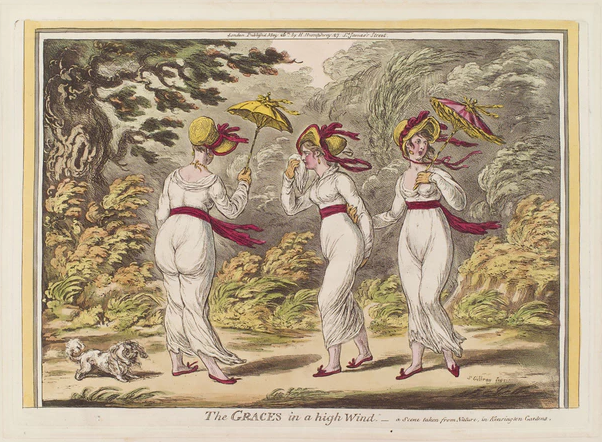 The regency love of all things classical wasn't always suited to life in Britain. Ancient Greece maybe. Even 'current' day Italy. But thing were a little cooler, damper and less comfortable in England for the ideal image of the casually draped whispy sheet over the girlishly youthful figure that society sought to emulate. 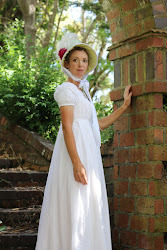 Stays had changed drastically to suit the ideal silhouette, and so had the petticoats and 'shapewear'. No more bum rolls, hip pads or boned panniers. And also no more bulk-creating petticoats. Petticoats had been reduced to minimal and as thin as possible. This gorgeous petticoat inspired me, though I did include a very tiny bit of gathering at the front. 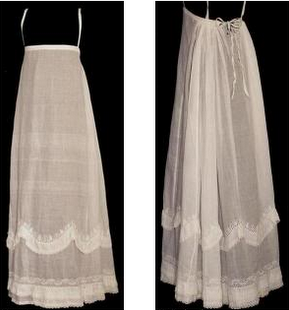 The bodiced petticoats that are more commonly associated with this type is more the exception than the rule, and instead petticoats were held up to the fashionable height using pins to the stays, buttons, and also these straps. It all helped reduce bulk and keep things fine and dainty. Lawn tears easily, so I ripped a strip approximately 5 cm wide for the waist band. Then I ripped the remainder across to the length plus 3-4cm (1cm SA for waist band and 2-3cm for hem). These two widths are sewn together down the selvages using a combination running and backstitch at a stitch length of approximately 3mm. One side is knotted off firmly 20cm from the top for a side-back opening. The remainder has the selvages folded back as a self-facing and then stitched down with a running stitch. The waistband is ironed nice and flat, cut to the underbust measurement plus 2cm SA. The short edges have 1cm folded in and ironed, then the long edges have 1cm also folded in and ironed. Finally the whole length is folded in half, encasing the raw edges, and ironed flat. Fold the petticoat in half and mark the centre front point with a pin or chalk. For the above petticoat, take your underbust measurement, divide by half and mark this distance either side of the petticoat centre front again using pin or chalk. These are your side front points. Next, knot firmly some strong thread at the side front points and gather the remaining petticoat at about 5mm spacing approximately 7mm down from the raw edge. One side from the front ungathered area will be about 3/4 of the fabric, while the other side will be about 1/4, due to the opening being at the selvage edges. Draw up this evenly until it matches your underbust measurement. Open out the ironed waist band, and place the long raw edge even with the raw gathered edge of your petticoat. Pin at each edge of the opening first, and possibly the centre front, keeping the folded edge of the opening even with the ironed folded edge of the waistband. Adjust the gathers until they measure the same, pin, and stitch using a backstitch. 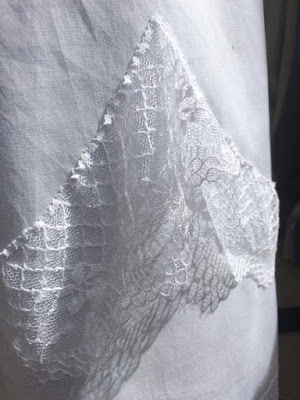 Flip the waist band over like binding, fold under seam allowance of long and short ends and whipstitch into place, catching the gathers. I finished the closure with a hook and eye. Next, sew on the straps at the back waistband. You will need to try the petticoat on to wee where to do this. Then pin the front of the straps where they fit. Remove and sew onto the waistband. 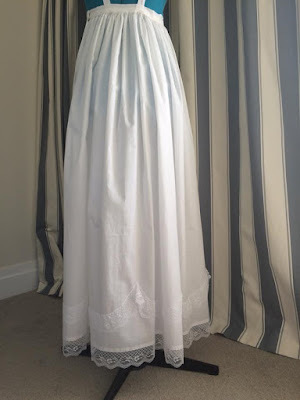 For finishing the bottom hem, I did several pin tucks until the length was about right for my gown. It's best to be above the ankle so that it will suit several styles of dress. Then I hemmed the bottom and sewed on some lace. Finally I created the 'swag' effect using more of the lace. 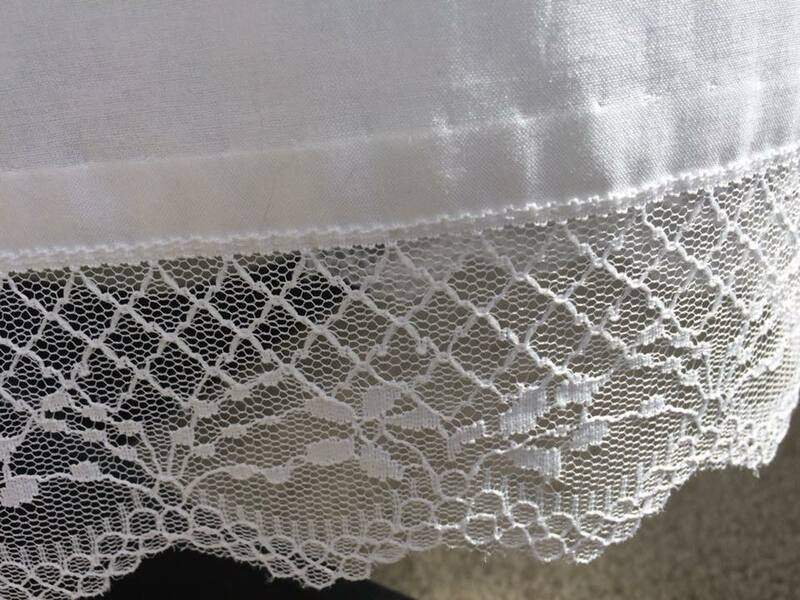 Though fairly subtle, it is very pretty and changed a very plain petticoat to a pretty piece of underwear.